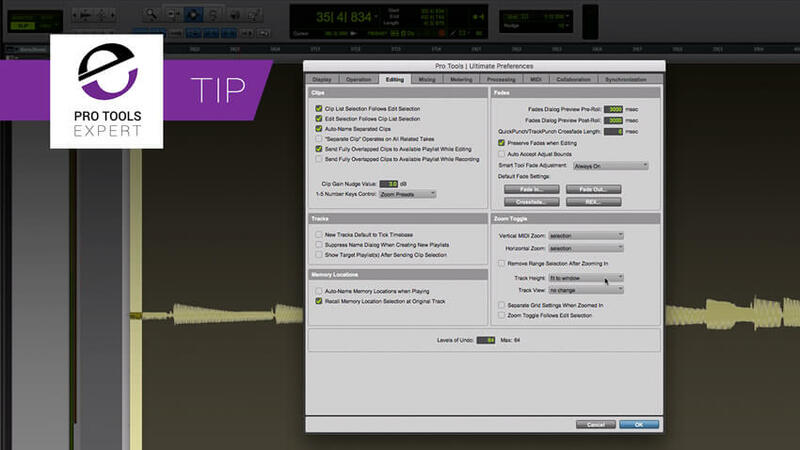 In this free video tutorial, Pro Tools Expert team member Julian Rodgers demonstrates Zoom Toggle and a way to exit Zoom Toggle while staying zoomed in. Set up in Preferences - Editing. I prefer to have the track height parameter set to 'fit to window'. that way when I hit E in Command Focus, I zoom in to my Edit selection so that it fills the screen. Very occasionally I find I'd like to stay zoomed in but use the Zoom Toggle feature to zoom in to somewhere else too. By using Option+Shift+E (Alt+Shift+E on a PC) I can come out of Zoom Toggle without having to revert to my previous level of zoom. In the free video, I also demonstrate a couple of must-have zooming shortcuts for backing out of any edit window zooms and viewing the entire session.